Thank you! You are Successfully added in our subscriber list. Pushya Hospital has treated more than 10000 patients across the Globe. 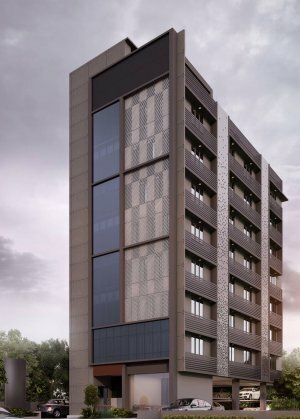 The hospital is 52 bedded facility which offer services in spinal surgery in Ahmedabad, Joint Replacement Surgery, Dental Surgery, Orthopedic Trauma & Fracture Surgery and Arthroscopic Surgery, Urology, cosmetic & Reconstructive Surgery, Neurology and Neurosurgery among several other medical facilities. The treatment facilities are available to our patients 24 hours/day and 7 days/week. 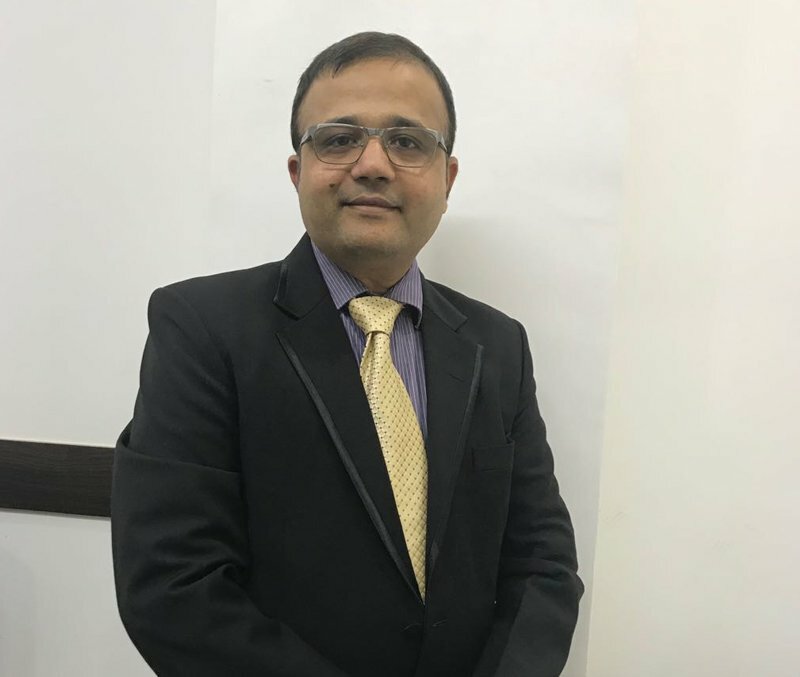 "To be among the best spine Treatment and joint replacement center of the world and a preferred medical institution for treatment of Trauma, Urology, Cosmetic, Dental and other medical conditions through world class technology, human expertise and highest professional standards at competitive costs." Best experience ever with Dr. Viral B. Shah and team in Pushya Hospital. Humble, Calm and composed Doctor with quality touch. I appreciate very much the dedicated team and the team spirit witnessed. May God bless the work of your hands as you serve HIS people. For comprehensive medical care, consultant Dr. Viral Shah and your problems will be ALL sorted. Dear Dr.Dhruti Maru, Your communication skills helped a lot. Thats what captured my attention at first. You took out the medical jargon and explained to me what was happening to my body and the importance of physical therapy. I was absolutely reluctant at first and you saw the need to reach out to my psychological understanding of the physio process even before the physical. You also kept on encouraging me that l won’t need surgery and that l will get back to my normal dreams and activities of dancing and wearing heels. Keep encouraging patients and helping them understand the process Am glad to have met you as you’ve literally walked with me through a very tough point in my life. Now my beautiful legs have a new lease on life; Walking again normally feels like heaven and hence l cannot wait to be fully recovered. You’re an amazing physiotherapist... you’ve changed my life and you will change many more. Thank you very much for making my mom walk again Dr. Viral B. Shah!You did an amazing job together with your team and I would definately recommend you over and over again. Many thanks to your friendly staff and not forgetting Dr. Rupesh. May God bless you! 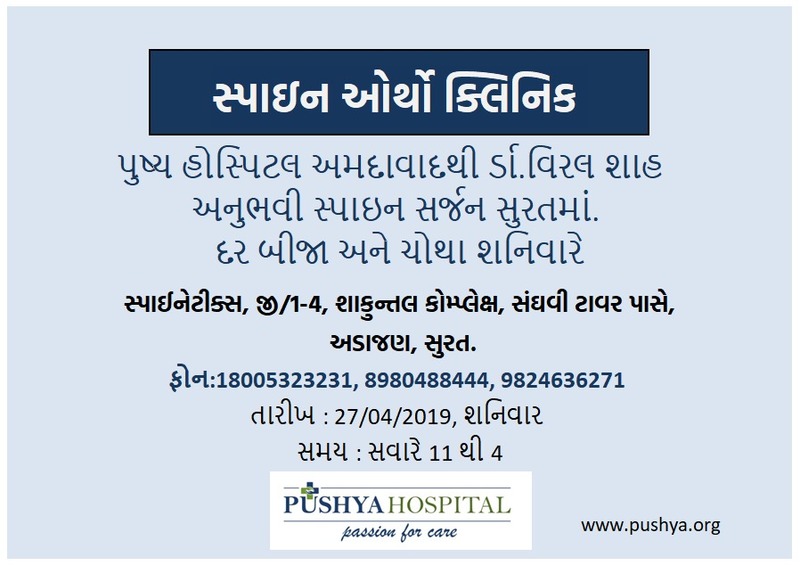 Am very glad for the treatment my wife received from Pushya Hospital - Spine treatment hospital in Ahmedabad. I and my wife appreciated the care and support we get and to my few words "everything was profesionally done". It is a place I can proudly recommend everbody to consult for spine related complications. I had shoulder surgery done to fix My type III AC joint dislocation. It was do e professionally and I'm thankful to Dr.Viral and his team for the work done before, during and after surgery in ensuring complete healing. My Grandmother has been experiencing difficulty in ambulation and extreme joint and lower back pains for over 8 years. She was brought to India under the care of Dr Viral's team in mid February 2018. I was pleasantly surprised when I came to see her to find her walking without any difficulty, not being fully dependent on her walking aids. She reports that her joint and back pain is gone. The whole team of doctors and physiotherapists have been of immense support throughout the surgeries and rehabilitation. I Reflosa Wanjiku, had suffered from back pain for more than 10 years. I had tried so many remedies which no improvement. On 04/05/2018 I was seen by Dr. Patel at Kirani Mission Hospital Spine Clinic and after 2 months of treatment now I can be able to walk well am still on follow up but there is a lot of improvement. Tahnks to Dr. Patel and team. As one of your patients and one who has benefitted immensely personally and referred many patients to Dr Viral and Team , it has been always good stories of great care that surpassed their expectations.I thank God for you guys and I pray for you always that God will expand your territories and frontiers as you help to alleviate patients' suffering.Kudos to the great team at Pushya. May you grow in leaps and bounds far beyond your imagination.Kudos to the great team at Pushya. May you grow in leaps and bounds far beyond your imagination. 2nd Floor, B-Wing, Doctors Park, Park Land 3rd Avenue, Nairobi, KENYA.